The year is coming to an end and at some point you will need to sort through the piles of paperwork that accumulated on your table. It might be tempting to just put everything in one big box and forget about it, but at Bay Management Group we strongly recommend you to take the time to organize the paperwork pertaining to property management. These documents may come in handy if your former tenant decides to rent from you again. You’ll be able to access the payment history and asses tenant’s performance to decide whether you want to rent to him again. Also, if someone requests references about your former tenant or if a tenant attempts to seek compensation from you based on false claims – you will have the paperwork to back up your statements. As handy and talented as you might be, you probably had to outsource property maintenance or other services at some point. Make a separate folder to keep a tab on every contractor you have hired to work on your property. If they did a great job, you know who to call in the future if a similar issue occurs. Keep this directory updated and you will end up with a list of reliable craftsmen that can do the job right. Building relationships with contractors may also earn you discounts and special treatment. How long should you keep all these papers? The answer is anywhere from one year to forever. 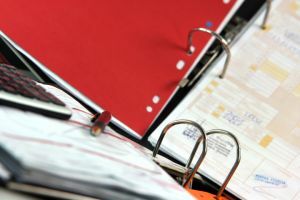 Of course, such crucial documents as mortgage and ownership paperwork you’ll need to hold on to, but something less important like receipts can be discarded after one year. Just in case, make digital copies of everything you are planning on throwing away. Keep them on an external hard drive, so that you won’t lose everything when a computer crashes. And remember, if that sounds like too much work that you don’t have time for, your local Baltimore rental property management company can do all the bookkeeping for you!